Helen Glave, on-site host of the Florence Untour, is a whiz with logistics and hospitality. But she is also deeply knowledgeable about Florence’s sights. We recently ask her to name her favorite hidden gems of Florence. Here is her response. It is quite difficult to signal ‘hidden gems’ in Florence as most are so well documented. Here are a few personal favorites, places that might be easy to miss or overlook. Although they might be known, they are a lot less busy than the main attractions. Spectacular views, a nice place to hang out on a sunny day, and is is not overrun by tourists. It’s also perfect for an aperitivo as there’s a bar at the top. You can also access Boboli from here.This is an off-the-beaten-track alternative to Piazzale Michelangelo and the Rose Garden. Officina Profuma Farmaceutica di Santa Maria Novella. I love it because it smells delightful and you can combine some art and history appreciation with your gift buying. Ghirlandaio’s Last Supper probably influenced Leonardo’s work. I love it because it’s peaceful, restorative and doesn’t overwhelm. Only open on Monday and Saturday mornings. The Church of Ognissanti is also worth a visit for Giotto’s crucifix, St. Francis’s robe, the tomb of Caroline Bonaparte, Napoleon’s sister, and the Vespucci chapel with its portrait of Amerigo Vespucci. This is hardly a hidden gem, but it is a personal favorite. I could just spend hours admiring the workmanship behind the objects on display while the crowds skip this museum for the painting galleries. Michelangelo’s crucifix hangs here. Until recently it cost nothing to go and see this breathtakingly beautiful piece of work. It costs nothing to see Ghirlandaio’s frescoes with their depiction of the street outside in the 15th century and portraits of notable Florentines, such as Lorenzo dei Medici, his sons and their tutor Poliziano. See Benozzo Gozzoli’s Procession of the Magi here. Again, not really a hidden gem, but it is a personal favorite. It is just gorgeous, even by the high standards of Florentine art. Most people go to Pisa and Siena, but lovers of antiques should consider Arezzo as an alternative. It’s an easy one-hour train ride from Florence. The antique fair is on the first Sunday of the month and preceding Saturday, Apart from that there’s Vasari’s house, important frescoes by Piero della Francesca, and in general it’s a lovely, relaxing, and relatively quiet place to visit. 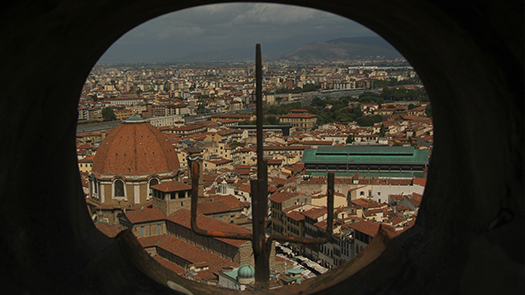 Plan your Florence getaway with Untours. The Florence Untour gives you plenty of time to explore the most popular sights and discover these and other lesser known places, plus access to our local staff person Helen. She is an excellent local resource and can help you find your own hidden gems!